SAN DIEGO (California) – This was all kind of inevitable. 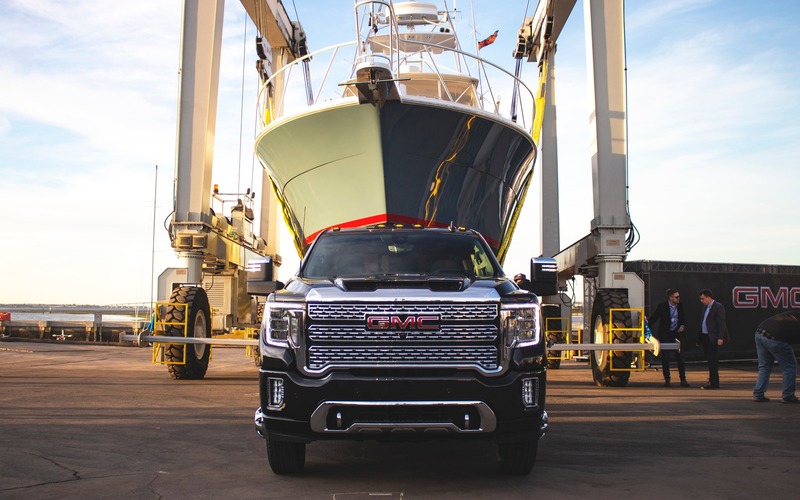 After the arrival of the Chevrolet Silverado HD just before the holidays, and the Ram HD recently unveiled at the Detroit Auto Show, it’s GMC’s turn to present its all-new workhorse. And, to nobody’s surprise, the numbers are big. Very big: 445 horsepower, 910 lb.-ft. of torque and a 30,000-lb (13,607-kg) towing capacity. Yes, these specs are almost identical to those of its mechanical twin, the Chevrolet Silverado HD, but to our eyes, the GMC looks even angrier. Available in dealerships by the end of this summer, both the GMC Sierra HD 2500 and 3500 will be powered by only one engine, GM’s 6.6-litre Duramax turbo-diesel V8. At the moment, nothing has been said about a gasoline engine or a six-speed automatic gearbox, like its brother. One thing’s for certain, this GMC gets the Allison ten-speed automatic unit. 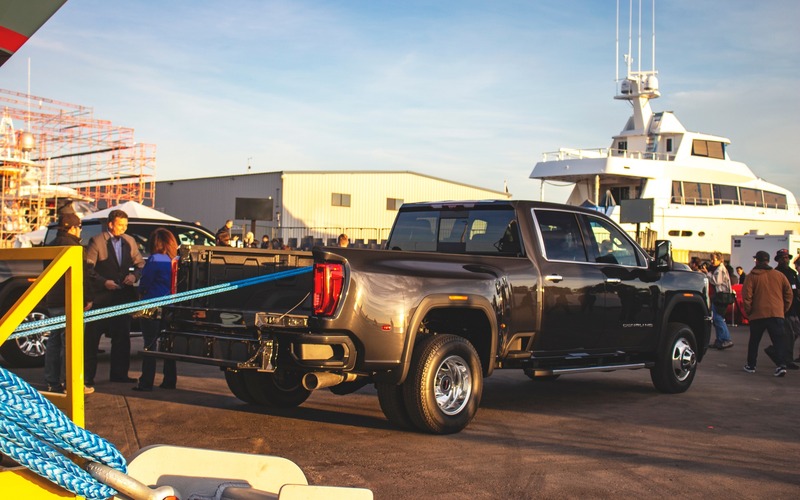 The Sierra’s Heavy Duty lineup keeps the base truck’s adorable traits, like the functional MultiPro Tailgate, a head-up display and the CarbonPro bed. And like the Sierra 1500, the HD can be dressed up in both Denali and AT4 trims. The latter adds Rancho shocks, a two-inch lift, skid plates and an Eaton rear locking differential. It’ll compete directly with the Ram 2500 Power Wagon in the exclusive segment of big adventurous trucks. GMC claims its new work machine has a significantly longer wheelbase, but no numbers have yet been released about that. The entire chassis was also reinforced to better sustain heavy loads, and the truck comes with a full battalion of towing technology such as a camera that can spot the trailer in up to 15 different angles. One of them even allows you to see right through the trailer itself! 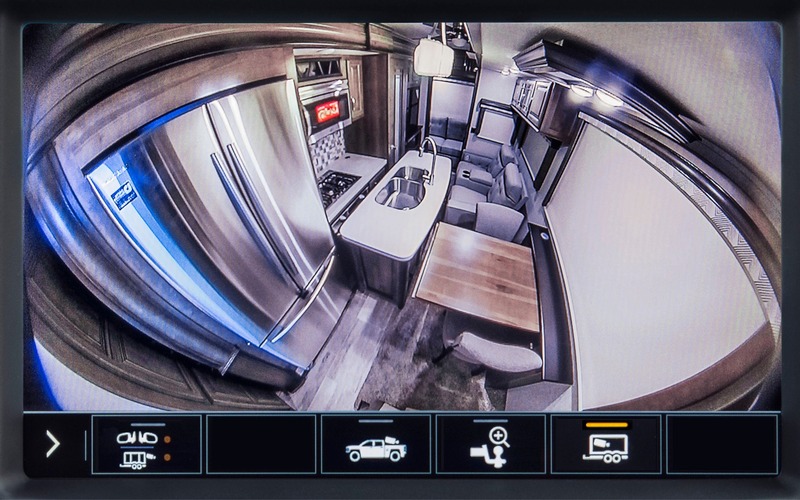 There’s also a rear-view mirror backup camera as well as an all-new and rather clever trailer stabilizer system GMC calls Trailer Sway Control. Essentially, the 2020 GMC Sierra HD promises to be the strongest heavy-duty work truck the brand has ever sold. Prices, payload capacity and fuel consumption ratings, as well as other useful specifications will be released later this year, a few months before the trucks hit our market.